Unfortunately, Ookla didn't compare broadband pricing, however. 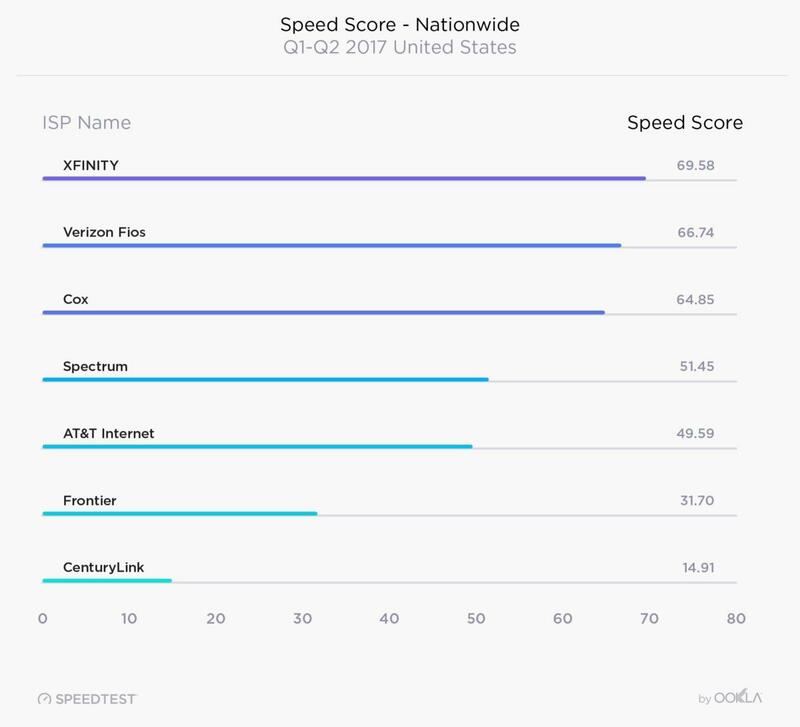 Comcast is the fastest broadband ISP in the United States, according to Ookla, the developer behind the popular speedtest.net website. 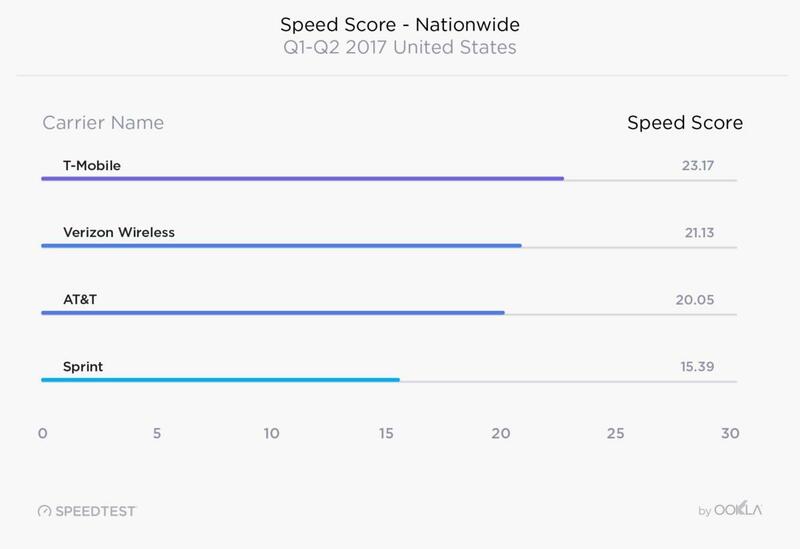 Ookla also named T-Mobile as the fastest wireless carrier in the U.S.
Ookla found that Comcast Xfinity narrowly topped Verizon’s FiOS service as the fastest broadband ISP, while T-Mobile just edged out Verizon Wireless as the fastest wireless carrier. The data reflected 26 million unique broadband users, performing over 111 million tests across Ookla’s service. In the mobile space, about 3 million unique devices were used to generate 14 million tests, generating a comprehensive look at how each service performed both nationwide and over time. In both wired and wireless tests, Ookla generated its own “speed score” to measure such factors as latency, and how the networks in question varied from region to region. The most significant factor in increasing broadband speeds, Ookla found, was the transition to DOCSIS 3.1 modems, which helped boost speeds dramatically and made pricing innovations, such as a $69 gigabit package offered by Verizon, feasible. What’s a “good” download speed? Well, according to Ookla, the average within the U.S. for the first and second quarters of 2017 was 64Mbps down, and 22.8Mbps up. “These developments lead to direct improvements in speeds for individual ISPs and also spur the kind of competition that makes better, faster service available to more people,” Ookla found. 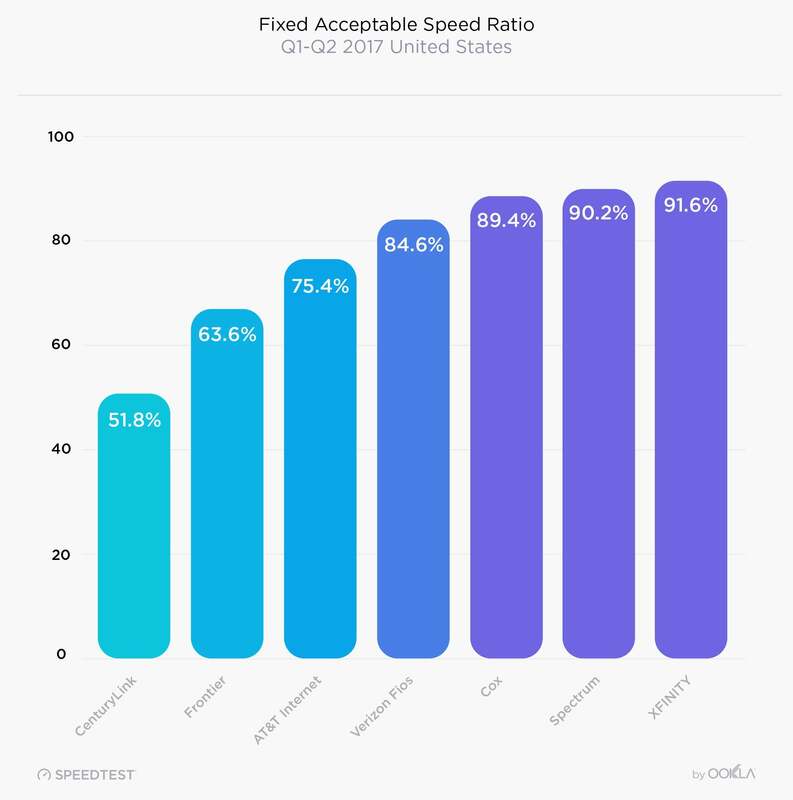 Comcast’s Xfinity also scored the highest when measuring what Ookla called “acceptable speed,” or the number of times that the available speed climbed above 10Mbps. That’s fast enough, according to Ookla, to stream HD video while someone else on the same connection can adequately access the Internet. Comcast delivered that level of service over 90 percent of the time. Comcast may be the fastest overall, but in certain areas, other competitors prevailed. In Southern regions like Texas and Florida, you’ll want to buy broadband service from Suddenlink. 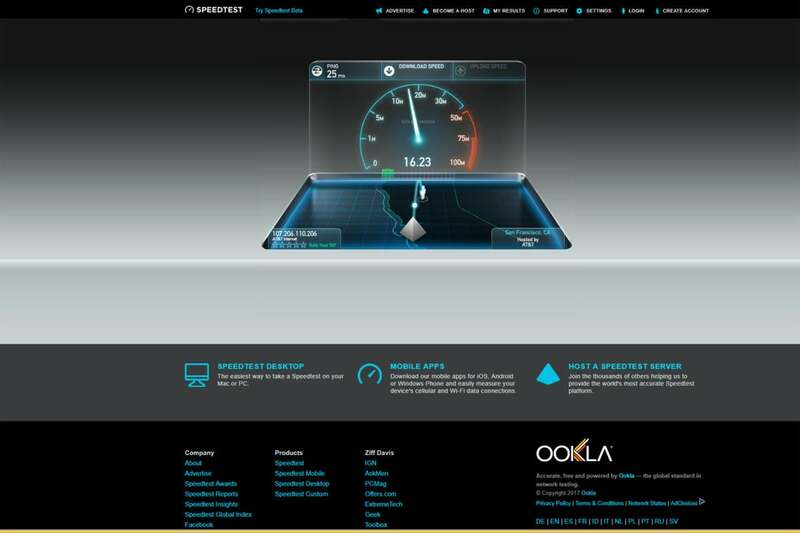 In Midwestern regions like Chicago and St. Louis, Mediacom provides the fastest broadband service, according to Ookla. In fact, Ookla also looked at the “winners” in major metropolitan areas, and found that Spectrum was the fastest in 24 of them, topping both Cox (19) and Comcast (18). The average download speed by a wireless user was 22.69Mbps, according to Ookla—good, but just 44th in the world behind Fiji and Germany. Some of that is affected by the decreased speeds in rural areas, naturally. That’s part of what differentiates T-Mobile from Verizon, according to Ookla. T-Mobile has invested in speeding up its network, while Verizon spent more heavily in making its network “denser,” adding small cell towers and antennas to improve coverage. Ookla wasn’t able to offer a comprehensive assessment of which wireless ISP offered better coverage than the others. Across what’s known as the 100 most populated Cellular Market Areas, however, T-Mobile outscored the others, with a “speed score” of 23.50. That’s higher than the 23.21 for Verizon Wireless as well as 21.17 for AT&T and 16.20 for Sprint. What this means for you: For wireless service, speed might not be the most importanrt factor in your purchasing decision. But for broadband service, it probably weighs more heavily. In that case, your choice is clear: According to Ookla, Comcast wins.